In part 1, we laid the groundwork for understanding the source of theological fragmentation. Now in part 2 we zoom in to examine one major culprit in ministry fragmentation and how to solve it. This is quite a large topic with an array of things under it. Why is it that communion must be administered by the leaders of the church instead of a more every-member-serving perspective (including women, or teens, or kids)? Why is the Lord’s Supper reduced to a wafer and sip of juice taken in an individualistic manner instead representing and role modeling the messianic end time feast with its full communal emphasis (Rev. 19; i.e. agape feast)? Why do we focus on programs to the near exclusion of the home as a center for ministry (e.g. hospitality)? Why is it that most ministries run and are successful because of the labor and creativity of so many faithful woman, praise the Lord, yet where are the men? Especially given their enormous and out of proportion impact on passing on the faith to their children! Why is it that Scripture portrays an intergenerational group of believers gathered regularly for worship, yet for all of its pro-family speak the modern church has a penchant for turning around and separating the family from one another for every event and program (Sunday School, men’s group, women’s group, youth group, senior group, singles groups, divorce care groups, newly married groups, etc.). No doubt as Darwin Glassford claims, “generational fragmentation is a symptom of deeper philosophical and pedagogical issues…” (we have not the space to unpack that more but see his article Toward Intergenerational Ministry In A Post-Christian Era). Or it could be simple things like our vocabulary referring to the “worship band” and “worship time” in Church when all of life is worship for the Christian not just the singing time. But I think the biggest source of ministry fragmentation in the church is the result of not understanding the role of preaching vs. teaching in the New Testament and its relevancy for developing a holistic Gospel worldview. To this we give considerable attention. How many pastors bleed for their sermons on a Sunday morning? How many pour out every creative thought they have, every biblical truth they can muster in the best way possible in order to motivate, encourage, and equip their people? All this only to watch over the course of years their people grow like snails…. crawling up hill…through molasses….on a cold winter day. Pastors then wonder what is wrong with them, their style, their personality, their skill, or they begin to wonder what is wrong with their people and they may even become hostile in their hearts towards their seemingly “disobedient” flock. For the most part in most churches the pastor preaches the sermon and it evaporates into the air once he’s done. No one talks about it with him. No one sits and processes their own life application. No one asks follow up questions. Like robots they just come, sit, stand, sit, stand, sit, receive the sermon passively, maybe remember one point (if the pastor was particularly funny or witty that morning) and then march out never to speak of it again. Sunday School or small groups is where people can ask questions…just not about the sermon…we don’t talk about that. If family discussion questions are handed out, they will likely fall between the seat of the car on the way home or get left on top of the microwave. All in all, the pastor only ever seems to hear the sound of silence from his people. At least this is how many feel. How Can The Saint In The Pew Help? How Can The Saint In The Pulpit Help? In response to sermon fragmentation some Christians are advocating throwing out the monologue sermon altogether because of its Greek origin (among other reasons so Viola), and replacing it with various forms of interactive dialogical teaching. Before reacting too fiercely to this notion let us point out that this movement does provide a helpful corrective to remind us that the “sermon” is very much an expression of biblical principles and we need not be enslaved to its particular form any more than we are tied to the form of having Sunday evening service or mid-week prayer services. There is nothing unbiblical about monologue preaching mind you (contra Viola), in fact it has some very important uses in the NT (especially evangelistically), but the question is, can other forms sit at the table beside it or is it hogging all the seats? Does it have to be an either/or choice or can it be a both/and? When Moses delivered his three monologue sermons to the nation of Israel (what we call the book of Deuteronomy) he commanded them and expected them to dialogue about it within the family (Deut. 4:9; 6:6-7; 11:19). In fact, dialogical teaching was the key to the preservation of the entire nation of Israel for the coming generations. What are you doing, dear preacher, to bring dialogue into your message? Preaching Vs. Teaching – Content and Audience as Distinctive? More importantly, does the sermonic form as it stands today do what we want it to do when it comes to growing our people to maturity, equipping the saints for the work of ministry (Eph. 4:12-16), or integrating biblical theory and praxis into their daily lives? Teaching and preaching were also quite central to these small, simple meetings but took on an informal form with a strong dialogical component, which was more inviting to the inquiring mind and more effective as a catechetical tool than a more formal oratory form. 1. Preaching generally refers to the proclamation of the gospel (Kerygma) and teaching refers to the faith (Didache). 2. Preaching was very important in the life of the first century churches. 3. Paul avoided the polished rhetoric style of the professional oratory of his day. 4. Paul devoted a tremendous amount of time to preaching and teaching. 5. Paul’s teaching had a discussion or dialogue identity both in kerygmatic public situations (hall of Tyrannus) and catechetical (didactic) situations in church assemblies. “Preaching is for evangelization, to bring sinners to the Savior. Teaching however, is for edification, to instruct and thereby spiritually nurture believers in Christ. One calls for repentance; the other for discipleship. One is to bring spiritual birth; the other is for spiritual growth. Evangelizing is bringing lost sheep into the fold; teaching is feeding and guiding those sheep” (Teaching As Paul Taught p. 39). In reaction, some of Dodd’s critics swing the pendulum too far the other way denying that any of his observations have any merit at all. Might we find a moderate position that issues from an exegetical foundation? (Zuck does go on to balance out this picture too). While the two terms can generally be differentiated according to their content (i.e. kerygma vs. didache), and audience (i.e. unbelievers vs. believers), these categories are not nearly as absolute as Dodd contends. The terms “preaching and teaching” often occur together as part of the Apostolic normative practice (Acts 4:2; 5:42; 15:35; 28:31; 20:20, 25; 1 Tim. 2:7), something which Paul commanded his elders to continue doing faithfully (2 Tim. 4:2) and expected the people to recognize as a characteristic of their office (1 Tim. 5:17). After all, Christians need the Gospel (kerygma) preached to them too (so Romans 1:15; Col. 1:27-28; 1 Cor. 15:1-2)! This point is often overlooked in Paul’s words to Timothy to “preach the word; be ready in season and out of season…” (2 Tim. 4:2). Modern minds move too quickly to interpreting him to be charging Timothy with the task of preaching all of Scripture in the widest possible application, but for Paul the content of the logos is nearly always the Gospel when read in context (1 Thess. 1:6; Col. 1:25 with v 23; Phil. 1:14; 2 Cor. 5:19; 2:17 with v 12). Paul knows there will be a day when Christian churches will “not endure sound teaching” and will go astray therefore he charges Timothy to “do the work of an evangelist” (i.e. preach the Gospel) within those very Christian communities (2 Tim. 4:3-4). Even his charge to Timothy to rightly divided “the word of truth” (2 Tim. 2:15) is not a charge to merely preach the expanse of Scripture, but explicitly defined for us by Paul in Ephesians 1:13 when he says, “…when you heard the word of truth, the gospel of your salvation, and believed in him, were sealed with the promised Holy Spirit…” It is no wonder then, that Luke, disciple of the Apostle Paul, follows that very same usage almost exclusively in his account of the spread of the Gospel-logos (Acts 2:41; 4:4, 29, 31; 6:2; 8:4, 14, 25; 10:36, 44; 11:1, 19; 13:5, 7, 26, 44, 46, 48; 14:3, 25; 15:7, 35, 36; 16:6, 32; 17:11; 18:11(? ); 19:10; 20:7(? ), 20:32). Like Israel, God’s people need constant reminders of the story of His grace. Christians are always called to grow deeper into the Gospel so that it grows farther out of them bearing fruit for the nations (Ps. 1). Both terms may even overlap completely as when Jesus’ entire 3-year kerygmatic preaching ministry is summed up by Luke as “teaching” (Acts 1:1). The point is that there is a symbiotic relationship such that both are necessary for the Christian community. A greater distinction between preaching and teaching can be made in terms of form – with preaching and its cognates associated with proclaiming and heralding (see Preaching in the New Testament for a concise treatment of the topic), and teaching more involved with reasoning, persuasion, and interactive encounters (Acts 17:2; 17:17; 18:4; 19:8, 9; 20:7; 9). Hence, we see in Scripture that one can preach the Gospel kerygma or one can teach it (both include believers and unbelievers). One can teach the didache or proclaim it (here almost exclusively to believers). This emphasis is sometimes overlooked in texts such as Ephesians 4:11 where Paul connects the two as “pastor-teachers” with one article in the Greek. The fact that they are governed by one article is not meant to imply they are therefore synonymous (e.g. in 2:20; 3:5 apostle and prophets are joined likewise, but nonetheless remain separate gifts). So, then what does it mean? The debate gets highly contentious, but Greek scholar Daniel Wallace argues that the grammar implies that “pastor” is in fact meant to be a subset of “teachers.” While all pastor-elder types should be able to teach (1 Tim. 3:2), not all teachers will be pastors or elders nor must they be (Rom. 12:6-8; 2 Tim. 2:2; Heb. 5:12; Jas 3:1; Acts 13:1). Paul may very well see “teachers” here not just merely as another gifting, but even in their own role and office (1 Cor. 12:28). According to Michael Markowski, professor of History at Westminster College “teacher” was not seen as just another spiritual gift in the early church, but viewed its own separate and funded ministry office within those local churches. He argues that “these teachers worked to mature the spiritual life of the congregation and so helped to free the pastoral ministry to focus on other duties, many of which fall on pastors.” He presses his point saying, “…the main task of teaching in the Early Church was carried on by (not merely overseen or administrated by) highly qualified Christian teachers” (Teachers in Early Christianity). Astonishingly, the Apostle Paul lists teachers above miracles and gifts of healings (1 Cor. 12:28)! A church with many teachers can work with their lead pastor to grow root and fruit in the congregation as they diffuse into every event and group. Markowski believes we need this same model today: “One way to increase the quality of Christian teaching is to restore the method of the Early Church—support of local teachers, on church staff, who teach the congregation and so need no 'day-job'.” This would restore the fragmentation we often see where churches hire an “assistant pastor”, a “family pastor”, a “youth pastor”- rather they should hire skilled Bible teachers who are responsible for all intergenerational groups equally. Preaching Vs. Teaching Today – Is The Sermon Then Lopsided? The main difference between Apostolic practice and modern applications appear to be that we bifurcate preaching from teaching so that preaching is what happens at the Sunday morning liturgical service and teaching is what happens at other times. We do not often preach what we are teaching on in the midweek, nor do we teach on what we are preaching on in the Sunday service. This all begs the question, are our sermons then lopsided? We get the proclamation element well enough, but when are we providing opportunity for our people to process the truth with questions and answers, to reason with us, or to enter into dialogue? This is the crucial missing element in the modern church. In Acts 2 when 3,000 new converts came to faith they required discipleship and spiritual formation. They met together daily in the Temple and each evening gathered in homes (v 46). If they met at the Temple to worship this would have included a more formal prayer time and preaching time as well, but the sheer numbers would not allow for interaction. Yet if they met in homes in the evening it would provide the most natural atmosphere for a more participatory teaching time (e.g. 1 Cor. 14:26). This pattern of the both/and continues as their numbers grew to 5,000 (4:4, 32-33; 5:42) and is still found 20 years later when Paul tells the Ephesians elders “I did not shrink from declaring to you anything that was profitable, and teaching you in public and from house to house…” (v 20). For Paul, proclaiming the kingdom of God ought to be followed by opportunities to discuss and question when possible (Acts 17:2; 17:17; 18:4; 19:8; 9-10; for Peter too so Acts 2:14-41 esp. vv 37-38; and for Jesus as well so Mark 4:1-20 esp. v 10). We get a snap shot of Paul’s method during his famous all-night “sermon” when Eutychus drifted off to sleep and fell out the window and died. In fact, it was not actually a sermon at all. In Acts 20:7, 9 Luke uses the word dialegomai to describe Paul’s teaching ministry here, meaning to discuss or to dialogue. Verse 11 describes it as homileo which means to converse or talk with. The whole affair was more of an interactive seminar. Peter tells us that some of Paul’s writings are “hard to understand” (2 Pet. 3:16). How much of an advantage then that he stuck around to question others and be questioned by them in order to make sure his people were grasping the full depth of his teaching? Paul was a rabbi, his father was a rabbi, and from what can be ascertained about rabbinical instruction it all involved some form of ancient catechesis so this all makes sense. In Col. 1:28 Paul reinforces the goal of teaching, “Him we proclaim, warning everyone and teaching everyone with all wisdom, that we may present everyone mature in Christ.” Teaching is especially linked to growing in maturity. Sometimes we are so busy quoting something like, “preach the word; be ready in season and out of season,” (2 Tim. 4:2) that we miss this point even in that text. The following imperatives are often assumed to go with the concept of preaching when they actually grammatically link to teaching: “reprove, rebuke, exhort with great patience and teaching.” If teaching is a more open-air conversation then it allows for in-the-moment correction of fallacious ideas which better teaches disciples not merely what to obey (something the monologue sermon is good at), but why to obey and how to obey (something dialogical teaching exceeds at; cf. Matt. 28:20 where maturing unto obedience is tied especially to teaching as well). What is it about dialogical teaching that moves someone to maturity? 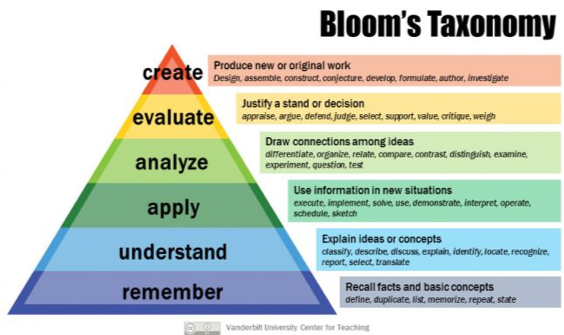 A partial answer from a modern perspective might be found in Bloom’s taxonomy. This is an educational tool that lists 6 levels of learning from remembering, understanding, and applying at the lowest level, to analyzing, evaluating, and creating at the higher levels. Did you catch that? Most pastors are content if their congregant can even remember one thing from a sermon! Now, if an average Christian can apply God’s truth to something in their life pastors are even more overjoyed that they are helping their people. How sad for us that pastoral hope for transformation does not even exceed the lowest levels of thinking! Interestingly, the most effective way to master these higher levels of thinking discovered so far is…dialogue and questioning (often coupled with concrete project based expressions to tie it altogether). In the end we could say that God designed true biblical teaching to move from information to formation to transformation through the content taught (all things Christ, both kerygma and didache), the context of teaching (a discipleship relationship within the community of faith) and the right conduit for receiving instruction (preaching with a heavy emphasis on dialogical teaching). · Break away from the form of the sermon you were taught and model your sermon on biblical forms so that you learn to impart “a Bible-shaped word in a Bible-like way” (so The Modern Preacher, The Ancient Text p. 10-20). While this does not introduce dialogue per se it does prepare the pastor and congregation to break out of tradition and ready them to better conform their message to the Word of God. · Develop a theology of interactive preaching which will influence how you speak, teach, pray, and disciple. Also, see Preaching Today’s helpful write up Part 1, Part 2, Part 3. · An effective pastor spends 20+ hours pouring himself into a message, why on earth do we think one and done on a Sunday morning is enough to digest it all? If your church has midweek small groups consider writing up provocative questions about your message that also involve redirecting them to things like biblegateway.com to examine parallel translations, or biblestudytools.com (select NAS, then from the gear icon then select Strong’s Numbers) to teach them how to look up and say the Hebrew and Greek words. This will create discussion, add depth, and pave the way for also asking why and how to apply the truth to their lives. Too busy? Delegate the questions to your elders. · Create a time after the sermon for a Q&A. This need not be every week per se, but even once a month or any rotation can have a long-term impact. Be sure to prepare people in advance by reminding them to jot down their questions on a piece of paper for each sermon rather than take questions off the cuff. Questions are typically more thoughtful this way and more questions are usually asked keeping the conversation moving. · Give people 2 min. during your sermon to summarize a point out loud to another person. At the Chapel we call this a blitz. One study I read years ago said students have a 15% retention rate in a typical college lecture, but if the professor gives them 2 minutes to summarize a main point in their own words out loud to another student, their retention rate goes up to 85%. So, consider placing a pause point after you deliverer some hefty content and asking people to summarize the key idea to another person. It introduces dialogue and only costs you 2 min., which is cheap for the reward you and your congregation get in return! · Select a series of sermons each year and take a seminar approach to them. People are creatures of habit, they do not like change for the most part. So, introduce one series in the year in a seminar style (and increase them over time as people warm to a new way of understanding God’s Word). This actually takes just as much if not more work for the pastor, but it is worth it! Here the preacher delivers the main point buttressing it with Scripture, then asks the congregation to form small groups where they are at in the pews to discuss key questions provided to them. After a period of time attention returns to the front where the pastor guides discussion through the questions hearing from all the groups involved. The cycle may or may not repeat given time constraints. We call ours “Bible study sermons.” We ask people to bring their iphones and laptops so they can compare the verse we are studying with at least three parallel translations using biblegateway.com, or look up the Greek or Hebrew word on biblestudytools.com. Participation is high, vital skills are learned, social barriers are broken down, overall body health is increased, and the pastor is far more encouraged. · Think outside of your individual church. If J.W. Bailey is right in his assessment of 1 Cor. 12:28 saying, “The apostle and prophet belonged to the whole church rather than to particular congregation, and the teacher is included with them,” and Michael Markowski is correct in his understanding of the office of teacher for local churches then we do well to envision a network of churches that formally employ skilled teachers who then regularly and consistently hold training seminars for leaders (elders/deacons/board, etc.) and laymen alike. The idea is a merging of the academy with the church so that those many qualified PhD professors get out of the classroom and into the trenches. No longer employed by the ivory tower, they would be employed by a collection of churches (or appointed by their denomination into this position) and accountable to them. They no longer teach only those enrolled in Christian college, but anyone willing to commit to their class/seminar. This is the kind of IT support the church needs (itinerant teachers)! E.g. Paul writes to the Ephesians church knowing they will read it out loud to the families who were gathered there. He addresses wives (5:22), husbands (5:25), and children (6:1; also Col. 3:20) who were expected to be with their parents. In Titus 2:3-5 he portrays a vibrant intergenerational ministry of older women to younger wives. In Deut. 6 Moses instructs the nation to be diligent about nurturing the faith of the next generation at every moment they get. Emphasis mine. ‘Preacher’ and ‘Preaching’: Some Lexical Observations, JETS pp.320-321. Jeff Reed founder and developer of BILD international, is no fan of the sermonic model and he would adamantly concur with this assessment: “I am increasingly convinced that the sermon should not be central to our assembly meetings. It probably should not even exist as we know it, but the role of skilled teachers in and amongst a city of churches is vital” (Churches of the First Century). Eight kerygmatic sermons are preached in the book of Acts, five by Peter (see analysis by H.N. Ridderbos 20p. pdf), one from Stephen and two by the Apostle Paul (see analysis by Kistemaker 11p. pdf). All of them given to non-believers and all of them monologue (see analysis by F.F. Bruce 21p. pdf, and his 15p. pdf 30 years later). The idea that preaching more often takes the content of the Gospel is reinforced by comparing the great commission text in Matthew 28:19-20 and Jesus’ words “make disciples” to Mark’s recording to “proclaim the Gospel to the whole world” (15:17); i.e. preaching/proclaiming is how one makes disciples and “teaching” is how one brings about maturity (i.e. teaching them to obey). Here “teaching” refers to life and conduct as well as content. observation is based, was far more absolute and consequently off base in his assessment. In his seminal work The Apostolic Preaching and its Developments Dodd attempted to isolate the difference between preaching and teaching in terms of both the content and audience for each one arguing that preaching always has to do with the kerygma (proclamation of the Gospel) and teaching was focused on the didache (ethical principles that issue from the Gospel), the former always targeting unbelievers and the latter exclusive property of and for the Christian community. See note 21 for a brief critique of this proposition. Reed’s observations are crucial for the recovery of NT practices yet we do not follow his conclusion when he says, “We have to deconstruct our ―Sunday morning liturgical event and its ―written beforehand, delivered to a congregation preaching paradigm (Farley), to return to the Early Church ―meal-based community event in order to unleash the triformula response of growth and worship” (#6 p. 17). For Oakwood Church this means meeting together for teaching on Sunday morning, but not for the formal preaching or liturgical time. But if note #6 above is correct, and if Evans is correct, then at the very least delivering a sermon to non-believers (many who visit on a Sunday morning!) is justified by his own reasoning as a legitimate form of preaching/proclamation. Since Christians need the Gospel too (Romans 1:15; Col. 1:27-28) and proclaiming the Gospel to them regularly is not optional, but commanded (2 Tim. 4:2) and expected (1 Tim. 5:17) as well. Reed’s concept of biblical teaching is well developed and helpful, but he lacks the same attention to defining biblical preaching and understanding its continued role in the life of the church. For an accessible treatment of the issue see Preaching In the New Testament: An exegetical and biblical-theological study by Jonathan I. Griffiths in the NSBT series (see the summary in Themelios). R.C. Worley was one of Dodd’s most severe critics concluding in his work that preaching and teaching were “the same activities and had the same content in many instances” (Preaching and Teaching In the Earliest Church, p. 86). He concedes that it cannot be fully established that the terms are synonymous, though they are close enough as to be indisputable, hence his new term “preaching-teaching.” What is rarely mentioned is that Worley, unlike Dodd, rejected the Acts speeches altogether as fabrications by Luke and thus does not incorporate them into his data. But see Arthur Rowe’s simple and effective defense at biblicalstudies.org.uk. Hugenberger notes, “In support of Dodd, it remains striking that in the vast majority of cases (although not every case, contra Dodd) ‘preaching’ in the New Testament is, in fact, directed to unbelievers” (ISBE 3:940-943 “preach”). Hugenberger may be thinking of actual examples of preaching (most of which are aimed at non-Christians), but we dare not deny Paul’s vital charge to Timothy to “preach the word” (2 Tim. 4:2), or to give double honor to elders who “preach and teach” within the community (1 Tim. 5:17). Clearly both are necessary to build Christ’s church. Griffiths recent work, Preaching In The New Testament, bears this out as well. He examines the three main Greek words translated “preaching” (evangelizomai, katangello, kerysso) and concludes that the vast majority do in fact occur in the context of the public proclamation of the Gospel to non-believers with a minority of the situations aimed at Christians (even then, we might add, the content tends to be primarily the kerygma). Paul employ’s the word logos 84x in his letters. For a breakdown of his usage see n. 88 in Preach The Word: A Pauline Theology of Preaching Based on 2 Tim. 4:1-5 by Stephen Oliver Stout. A Commentary On the Epistle to the Ephesians, 1856: p. 256. Dodd does get this, saying, “For Christianity, ethics are not self-contained or self-justifying; they arise out of a response to the Gospel” (Preaching and Teaching In the Early Church). In this sense, the indicative precedes the imperative (i.e. our identity in Christ precedes our obligations to Christ). Dodd’s understanding of the relationship between kerygma and didache is good though it is not a fully integrated whole. For this Ridderbos, a Reformed theologian, is superior. He articulates the relationship between the two arguing that while the two are different the didache always presumes and includes the kerygma and fleshes out its implications (See, Redemptive History and the NT. Or, read a helpful summary at Walking Together Ministries). Compare Matt. 4:23 about Jesus “teaching” in the synagogues to Mark and Luke’s description of Him “preaching” in the synagogues (Mark 1:39; Lk 4:44). In Acts 4:2 the apostles were both teaching and proclaiming Jesus and the resurrection of the dead (i.e. kerygma). Paul was “preaching” the Gospel in Athens (Acts 17:18) and the Athenians asked to know more about this “new teaching” (17:19). For preaching the kerygma e.g. 1 Cor. 9;16; 2 Cor. 2:12, but esp. n. 16 above. For teaching the kerygma see Acts 5:42; 15:35 (note “word of the Lord” in context is the kerygma so 18:5), 20:20-25 (Paul mentions “teaching” in v 20 and the content of that teaching is the kerygma so vv 21, 24). For teaching it see 1 Tim. 3:14-15; 4:1; 5:7; 6:2 where it includes the content of one’s life as well. For preaching the didache (admittedly rare since the focus is on teaching it unto obedience) see e.g. Rom. 2:21; Acts 20:20, 27 (possibly); Acts 24:24-25 (righteousness and self-control have to do with Christian living and hence he taught Felix about the didache and “the judgment to come” which is part of the kerygma so Acts 10:42). On a practical note this distinction helps Christians understand modern day evangelism a bit more precisely. Christians should not be heard to be telling people, “stop sinning,” or “stop being gay,” (both of which have to do with the didache) but “start believing in Jesus by turning from your sins to Him” (kerygma). P. 51, The Teacher In the Early Church in The Biblical World, Vol. 38, No. 1 (Jul. 1911) pp. 50-59. P. 284 of Greek Grammar Beyond The Basics: An Exegetical Syntax of the New Testament where he files the grammar under the category “first subset of the second.” For more detail see The Semantic Range of The Article-Noun-Kai-Noun Plural Construction in the New Testament in Grace Theological Journal. Jesus too as rabbi asked more questions than he ever answered. The term in the 1st century did not carry the connotations that it did 200AD and onward in more formal capacity mind you. I say “gifts” rather than “office” here following Hoehner in Ephesians: An Exegetical Commentary (2002) because I do think the office of apostleship and prophecy still exist and are active today. Not in the way envisioned by Pentecostalism or the New Apostolic Church, but in a way that that allows for the gifting of apostles in a more general less authoritative fashion (i.e. church planters) and prophecy as opposed to the office of prophet (so Piper). The Message of Ephesians 1979: 164 (full pdf book). Corey J. McLaughlin is a BICS, LBC, Gordon-Conwell graduate (MANT, MATH). He currently serves as an adjunct faculty member of Berkshire Institute for Christian Studies, and Berkshire Christian College, while pastoring the saints at Sheffield Chapel in Massachusetts. He is happily married to his college sweetheart and father to five energetic kids. He remains daily thankful for Christ’s indefatigable love.